Tired of your usual roasted veggies? 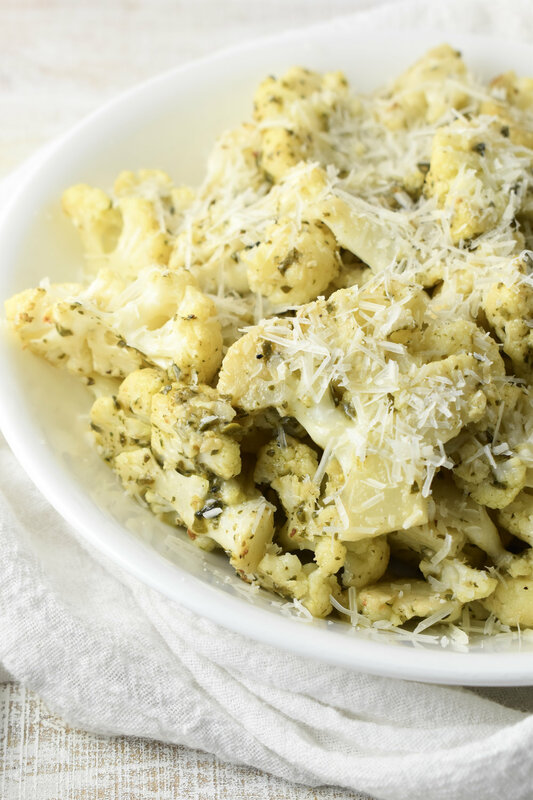 This Roasted Pesto Cauliflower was an unexpected hit a few nights ago (meaning my kids ate it with zero complaints), and it’s super-simple! Line a sheet pan for easy clean up, and then drizzle with a prepared pesto sauce half-way through cooking. Seriously, it’s THAT easy! Let me know what you think by sharing your final product on social media! Be sure to tag me : Instagram @realfoodreallife_rd / Facebook @Real Food. Real Life. - Carolyn Williams, PHD, RD. Choose a dairy-free pesto sauce and skip the Parmesan cheese to make it dairy-free! Line a sheet pan with foil. Add florets to pan, and lightly coat with cooking spray. Toss, and lightly coat florets again with cooking spray. Sprinkle with salt and pepper, tossing to evenly distribute. Bake at 425 for 8 to 10 minute or until beginning to turn lightly browned on edges. Remove from oven. Drizzle pesto over florets, and toss to fully coat all florets. Bake an additional 4 to 6 minutes on until just tender. Top with fresh Parmesan if desired.